The founder of the website WikiLeaks, Julian Assange, said the government of Russia has not been the source of the publication of emails from the Democratic candidate for president of the United States, Hillary Clinton. “The Clinton camp has managed to project a new-mccarthyism according to which Russia is responsible for everything, but they are not behind the leak”, Assange said in an interview broadcast Thursday by the television network RT Russian. In recent months, WikiLeaks has released more than 30,000 emails from Hillary Clinton on a private server she used when she was secretary of state. The portal has also reported around 20,000 emails sent and received by members of the Democratic National Committee, in which it is evidence of the hostile attitude of the party leadership toward Bernie Sanders and his primary campaign. New emails from Clinton could have been discovered on the mobile device of the ex-husband of one of her closer collaborators, Huma Abedin. While cyber security experts assume that the USA and Russia are spied mutually through computers, the dissemination of such information is a qualitative leap. Since the Democratic Party believe that the Kremlin seeks to influence in this way in the development of the election campaign to help the Republican nominee, Donald Trump. Russia has as a refugee to another filtered, Edward Snowden. And the founder of WikiLeaks itself has to conduct a program of interviews in the RT chain itself. 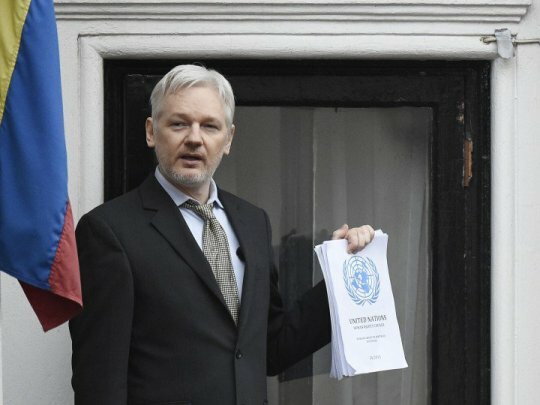 According to Assange, Clinton “has declared, falsely, that 17 American agencies think that Russia is the source of our publications and this is false. We can say that the Government of Russia is not the source”, said Assange from the Embassy of Ecuador in London, where he is a refugee for four years. One of the leading Russian tracks of hacking is the user name that appears in the modification of some documents: someone called Felix Edmundovich. It is not a pseudonym devoid of meaning: that was the name of the founder of the security agency that later would be the KGB. In hacking, beyond this name, several consultants have found clues pointing to an intervention from Moscow. One of them is CrowdStrike, which even came to point to the Russian secret service. But the second part, the filtration, is not so clear. It was the work of a user named Guccifer 2.0, and experts have no clear connection to Russia. “The source of this infiltration has nothing to do with Russia, I knew when I was in Washington a couple of months ago” said the former British ambassador in Uzbekistan and close friend of the founder of WikiLeaks, Julian Assange, Craig Murray. The Obama Administration has formally accused the Russian government of filtration for the purpose of “interfering in the electoral process”. Even US Vice President Joe Biden has suggested Russia hit back with another cyberattack. The risk of an escalation of electronic warfare is on the table. Even more delicate is the electoral situation in the US. The advantage of Clinton on Trump has been reduced. Revelations appeared at the last moment may tip the balance.